I remember Robb saying that what we saw in the animation and pics is what we are going to get in terms of trains. That should be a minor consideration since you guys now have a massive 300' coaster. That is just awesome. Would love to see one up here one day. I pray that my head doesn't get bashed around like it did at the end of Storm Runner. Is there any news on the Planet Snoopy makeover? With all this talk of I305 I haven't heard a thing about it. ^ Other than annoucing the names of the rides, not really. There have been no updates. KDFansite isn't interested as half the site is content with calling John Pagel a liar, bashing the OTSR, and debaing over pointless information. For the KDF regulars, it is getting rediculuous. I'm glad that their is sanity in this forum. I think the OTSR may cut your head a bit in the quick transitions but otherwise should really be a major factor in the ride. 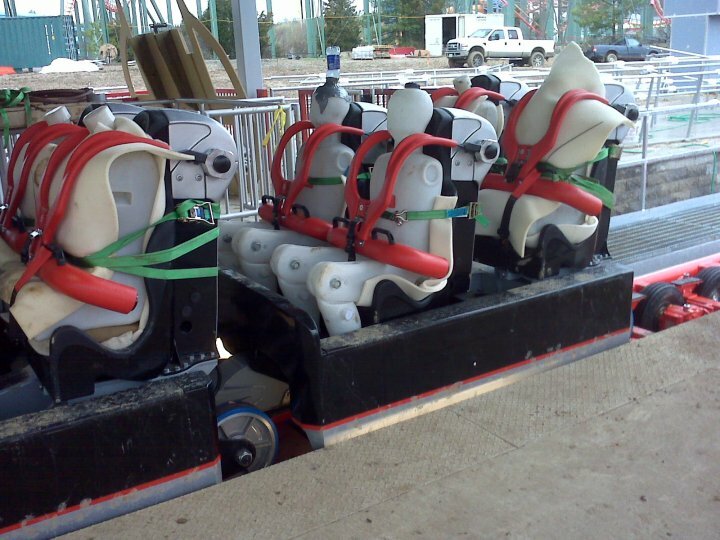 Same as with Maverick, if the ride had MF style lapbars, it would probably be the best one out there in my opinion. Intamin really should design new lapbars for the US that allow bigger people to ride. They are not unsafe or something, after all Intamin still used the old restraints on the mega lites and other lapbars on El Toro and Bizarro. Final Confirmation picture of the restraints, up close and personal. Boy they really need to wash those trains before opening day. EDIT: And why is there a bottle of Aquafina duct taped to the top of a dummy's head? It’s understandable that those closest to the project, such as members on local fan sites, will always feel more of a let down when they realize that they can’t predict the future and read minds. Everyone was a part of the process in a way so guessing games, creatively and dreaming are part of the fun, regardless of facts, animations and pictures. Calling this a failure or ruined is such an exaggeration though. I understand some minor disappointment but beyond that, can’t really understand why i305 would be considered ruined, especially if more people can ride it. You can’t blame KD for going with the info that they had. Obviously CF wanted something accommodating for more guests. Maybe the new strap OSTRs were of concern after computer modeling for a variety of reasons so they went back to the original design for this ride. Or, it was always going to be this way. If you think what’s going on in the KD fansite is crazy, you should have seen the arguing over the angle of decent not being as steep as published and trim breaks being added to Behemoth. People called Behemoth everything in the range of a disappointment to a failure. It’s definitely miles away from being anywhere close to a failure. On a final note, Chuck, thanks for the airport info! Skycoastin Steve wrote: EDIT: And why is there a bottle of Aquafina duct taped to the top of a dummy's head?